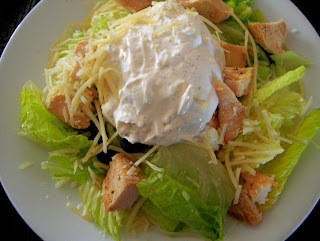 Picture wonderful, fresh Romaine hearts, beautiful pieces of grilled chicken and imported Parmesan cheese. One day, I had all of this on hand plus a number of other salad-friendly ingredients and, in a burst of creative energy, composed a mouth-watering dinner salad. The only thing lacking was the dressing. My mind said it should be thick and creamy. I could almost taste the flavor as I looked at those salads. Even though I had vinegars and oils, a favorite cherry dressing from Door County and packaged Italian dressing...none of these even came close to the flavor I wanted. I found the last of some sour cream in the refrigerator and combined it with an equal amount of Hellmann's Mayonnaise and tasted; I was on the right track. The next step was to sprinkle in my choice of seasonings and shredded pieces of an exceptional little block of Parmesan cheese. All ingredients were added without measuring; it just felt right and, when I tasted the finished dressing...all I could say was, "Wow!" My husband actually said the same thing, which was impressive since he usually just says, "This is good." This recipe makes enough dressing for two salads. Blend sour cream and mayonnaise until well mixed. Add seasonings to taste. Salt lightly. Add milk and whisk together. More milk may be added to bring dressing to desired consistency. Sprinkle in Parmesan cheese and mix gently. Makes two servings. Wash Romaine leaves and tear into bite sized pieces. Divide among 2 plates. Prepare the remaining vegetables and place on top of the Romaine. Cut chicken strips into pieces and divide between salads. Add half the dressing on top of each plate of food; sprinkle more Parmesan around the salad edges.